These round plates with deep side make great plates for serving stews or other sauce based dishes. Being oven proof make them great vessels for making and serving melted cheese dishes such as Queso Fundido, and the stark black color provide for a stunning presentation. 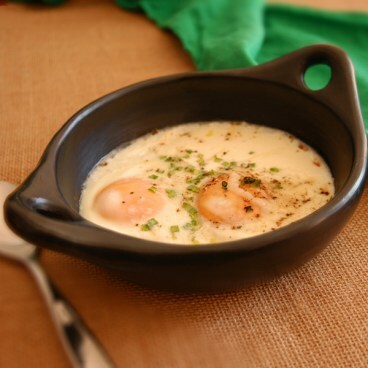 Huevos con Crema, or Eggs with cream is a great way to start any day. The recipe is perfect for that special breakfast in bed with someone special, and a great dish to use our Round Serving Dish with Handles.